Since our inception in 2002, we have been taking incremental steps to enhance our business efficiency. Apart from attaining the ISO 9001 certification in 2007 and establishing ourselves as a quality & safety first company via the Safety Management System (SMS), we are also ISO 14001 and OHSAS 18001 certified since 2009. Subsequently, we also received the BizSafe Star award in 2010, as well as the BCM ISO 22301 certification in 2014. This is followed by the Total Defence Award (MINDEF) in 2015, Singapore Quality Class certification in 2017 and Certified On The Job Training Centre (COJTC) by ITE in 2018. 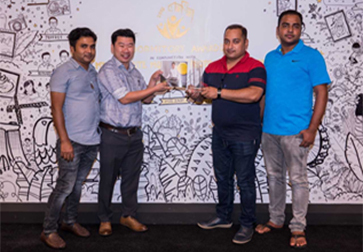 We are proud to achieve 2018 Best Dormitory Award presented by Minister of State for Manpower and National Development. 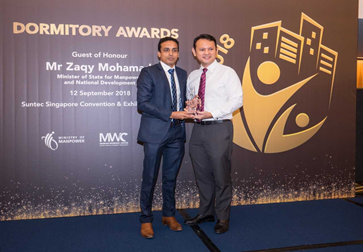 The Dormitory Awards aims to recognise dormitory operators who exceed basic housing standards and adopt good dormitory management practices, to enhance the quality of life for foreign worker residents. It is jointly organised by Ministry Of Manpower, Dormitory Association of Singapore Ltd and Migrant Workers’ Centre. The Association for Persons with Special Needs (APSN) together with Aegis Building & Engineering Pte Ltd is proud to announce a first of its kind nationwide Building & Facilities Management training programme for Persons with Intellectual Disabilities (PWIDs). The MOU (Memorandum of Understanding) has taken place at APSN Adult Center at Eunos on 19 July 2018 between APSN and Aegis Building & Engineering Pte Ltd.